Discover a new dimension of sensation at Sun Plaza! Any happiness is celebrated with the most beautiful gifts. 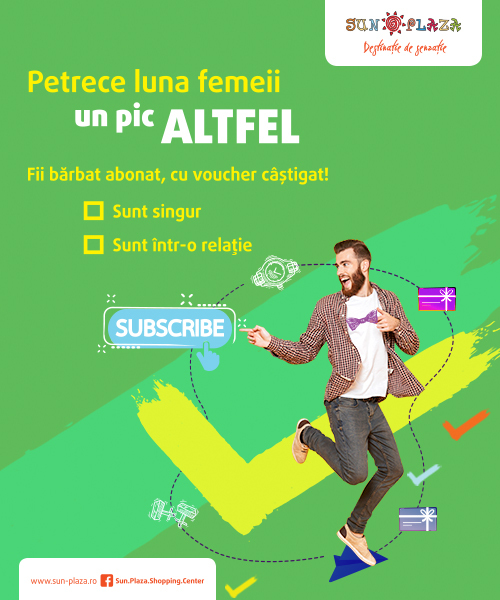 So between September 28 – October 1 show up to put Info Point with up to two Sun Plaza shopping receipts worth a total of at least 200 lei and win one of the hundreds of gift vouchers available in the new stores. The exception are Cora and Leroy Merlin stores, for which the value of the receipts must be at least 400 lei by the cumulation of two receipts issued on the same day. A sensational dialogue with contemporary art! 1. Join the Hungry Sharks Dance Band! Participate in the choreography workshop where you will learn urban dance movements under the guidance of professional dancers. 2. Get carried away by the vibrations of imagination alongside artist Peter Kogler! Participate in revealing a really impressive structure! Curved, vibrant lines have already transformed the underground subway passage into a hypnotic experience, but on September 28, at the end of the passage, an impressive 18 meter high lighting facility will come to life. Be there at 19:00, on September 28th! 3. Discover the encrypted message and you can win a prize! The urban installation built with 142 shiny balloons by artist Manuel Gorkiewicz will come to life with the hidden message waiting to be uncrypted. Do not miss the clues that will show up on the FaceBook page and get ready for the final reveal of the message on Oct. 10. Sun Plaza rewards you for the 7 years spent with us. Come and smile under the umbrella of elegance at Sun Plaza!